Wynter Pitts, founder of For Girls Like You magazine, gives girls a new devotional showing them a correct definition of themselves, opening their eyes to God's truth and the difference it makes in their lives. Each daily devotion includes a prayer to help girls apply the lesson. 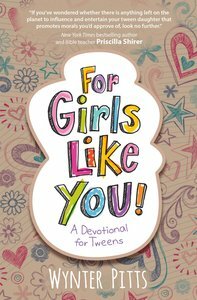 About "For Girls Like You: A Devotional For Tweens"
Wynter Pitts is the founder of For Girls Like You, a ministry to girls that includes a print magazine, and the niece of Dr. Tony Evans. She has a drive to introduce young girls to Christian values so they can walk passionately and boldly. A native of Baltimore, Wynter resides in Dallas, Texas, with her husband, Jonathan, and their four daughters.